A few days ago, our electrician brought us two branches full of Longan Fruit. Having never tried it before we were excited yet wary to try this new fruit with the nickname "dragon eye" because it looks like an eyeball when the shell is removed. 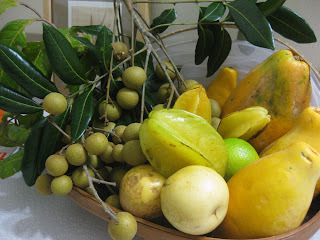 Here you see it along with some other goodies from our yard like papaya, lime, liliko'i and star fruit. You need to remove the shell much like a lychee. To crack them open you simply squeeze them between your finger and thumb until the thin brown shell cracks. Then peel off and pop in your mouth for a somewhat light melony flavor. It is very similar in texture to lychee, but I like the longan better. It is best to store them in the fridge as they spoil quickly if left out. Keeping them cold also makes the cracking of the shell easier. If you have never experienced longan and happen to see it in a specialty store, pick some up. But I warn you... they go fast. Once you start, it's hard to stop eating them. 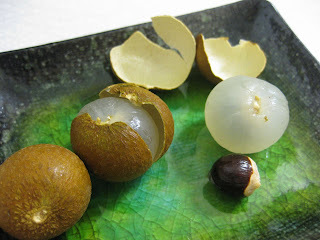 i'm thrilled that you have been introduced to 'longan'- which i grew up eating. you describe it well. my fam-of-origin pronounced it 'loung-gnanh' - which translates - yep - you guessed it - directly and easily - into - dragon eye (cantonese). i can hardly wait to 'see' (get it, dragon eye = see)(ahem) what fab desserts you incorporate this lovely fruit into.. I knew you would be in the know. Alas, there will be no tasty fruit concoctions. We have already eaten them all. Shoot! better than lychee?! i'll need to look for them in our asian markets. hello papayas. . . i miss you so. well... lychee are good... don't get me wrong. it's really sad to have so much fruit ripen at one time, because we can never eat it all. we had to chuck most of the papaya, but planted the seeds... oh great... now even MORE papaya to not be able to eat. i wish i could send to you. I always pick up a few branches when i'm in chinatown. They're not as good as when I've eaten them in SE Asia or Hawaii, but I still enjoy them. I think lychees ship better. deb, i know. i had to chuck out over 80 starfruit yesterday. they were rotten and had fallen to the ground. we try to give away but every is having the same problem. the trees are prolific at producing thousands of fruit... and it's only about 12 feet tall. it makes me sick to my stomach when we have to toss the fruit. i am going to see if the animal sanctuary can use them for the goats and other critters.